A group of students has two carts, A and B, with wheels that turn with negligible friction. The two carts travel along a straight horizontal track and eventually collide. Before the collision, cart A travels to the right and cart B is initially at rest. After the collision, the carts stick together. 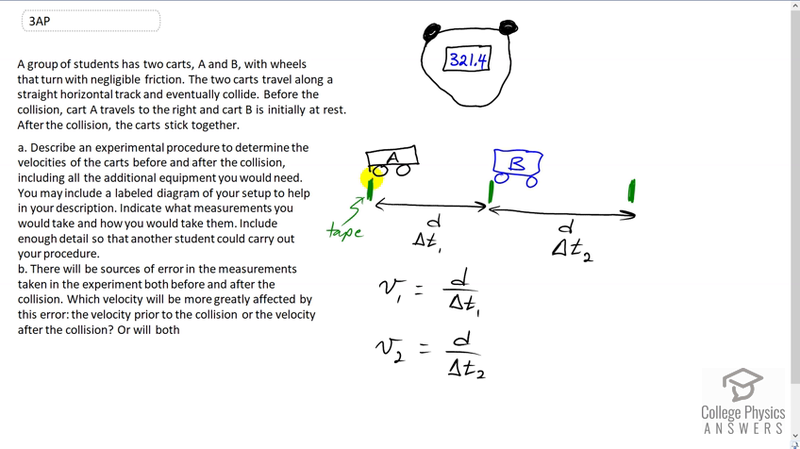 Describe an experimental procedure to determine the velocities of the carts before and after the collision, including all the additional equipment you would need. You may include a labeled diagram of your setup to help in your description. Indicate what measurements you would take and how you would take them. Include enough detail so that another student could carry out your procedure. There will be sources of error in the measurements taken in the experiment both before and after the collision. Which velocity will be more greatly affected by this error: the velocity prior to the collision or the velocity after the collision? Or will both sets of data be affected equally? Justify your answer. This is College Physics Answers with Shaun Dychko. Our experimental set-up here to determine the velocity of these carts before collision and after the collision, will involve putting some painters' tape or masking tape on the ground, that's what these green strips are, and the distance between them is known. We'll measure that with a ruler. And then we have a stopwatch that we'll use to measure the amount of time it takes for cart A to get to this position where cart B is and that'll be v one speed during this first interval of time and then when the carts stick together, we'll also measure the time it takes from here to the next piece of masking tape which is also a known distance, d and that'll take place over a time interval of delta t two and we'll calculate the speed of the combined carts as this distance d divided by the time interval to get from the middle to the end. So that should work and then sources of error, because the cart A will be going faster in this first interval, that means that delta t one is going to be less than delta t two given that I've created equal distances for both time intervals because the combined carts being heavier, are going to end up going slower and so delta t two is going to be smaller. Now the error in the stopwatch measurement will be the same for measuring both time intervals and typically you know, to estimate errors is a bit of a subject in of itself. But let's suppose we take the error in our stopwatch measurement to be plus or minus 1 of the most precise digit, that's tenth place say, that error will be the same for both times but it will represent a greater percentage error in the first time since the delta t one is going to be smaller. And so the error in measuring the velocity of cart A will be greater. so the error in velocity of cart A will be greater than the error in the velocity of the two combined. I guess I should use subscripts 1 and 2 here, shouldn't I 'cause that's what I did over here. So the error in velocity 1 will be greater than the error of velocity 2 because to calculate the error in velocities, we're going to add the percentage errors in each of these factors because when you're dividing numbers to calculate the error in the quotient, you have to add the percentage errors. The percentage error will be greater for t one than it is for t two since we have the same absolute error in both time interval measurements. That being with delta t one being smaller that error will represent a greater percentage of delta t one and so its percent error will be greater and so the error in v one will be greater as well.